I have probably talked about my Doran, the Siege Tower deck a time or two by now in my articles, probably more. Doran was my favorite deck and always my go to weapon of choice. It was a deck that I believed was destined for EDH greatness, and I never thought in a million years that I would take it apart. Me, Doran, and Rhys riding off into the sunset best of buds, that is how I always saw it in those early days through my rose colored glasses. Over the past four plus years I have built and taken apart more decks than I can count, ranging from one and done garbage flops, to dusters, to tried and true workhorse favorites, but Rhys and Doran were always the two pillars of my EDH stable. Beacons of light on the dark and treacherous EDH landscape. Then over a period of time I started noticing that I wasn’t seeing Doran all that much anymore. We were growing apart and I found myself purposely leaving him on the shelf at home instead of triumphantly heralding him as my champion ready to fight for my honor on the hallowed EDH tables of Win More Games. There was a nagging voice in my head telling me I should give him his pink slip and loot his bountiful sleeves of their tryhard staples. Then it happened. 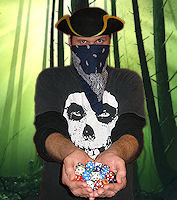 I was out of sleeves one day and there was Doran taking up space and plastic card protectors. Just like that it was over, Doran was just a pile of leavings. Like a movie cop shot down two days before retirement (retirorny), he was gone before he ever got to see the last two original dual lands, Scrubland and Bayou, I needed for the deck (got them on PucaTrade of course). That is when I realized that it doesn’t matter how much you treasure a certain deck, things change and nothing lasts forever in EDH. Not the most menacing looking treefolk but he was mine. My EDH deck arsenal has seen plenty of flash in the pan decks that I fell in love with, vowed were my favorite thing in the world, and then decided were all too incredibly wrong for me. Decks like Verdeloth the Ancient, Animar, Soul of Elements, Ghave, Guru of Spores, and several others have come and gone like a 24 hour bug. They all seemed to suffer from the same problem, tending to devolve into very bore inducing games every game they were piloted in. Each of these decks tended to do the same thing over and over, every game. With Verdeloth it was your standard almost singular minded mono-green strategy of ramp hard and then try and dump the entirety of the deck into play, most likely with haste. Animar on the other hand wanted to tempo the table out real quick then go infinite to kill them (what a jerk). Then there was little old Ghave that could go off (combo) by accident, unpiloted in its deckbox, in my bag, like a stick a dynamite in the hands a scientist trying to explain how volatile it is. So what went wrong with Doran? What was it tipping point? I am sure that the reasons are varied and numerous but I think the overall strategy of the deck (or lack thereof) and the bland sameness of almost every game it was involved in are as good as any reason. There were many incarnations of the deck that tried to implement various strategies in a large spectrum of successfulness, but the last strategy of every card being generically the best it could possibly be was probably it’s death knell. The simple act of card selection criteria of strictly better or best killed my deck. Card selection is a dangerous and challenging aspect of the game. A topic that was talked about on this week’s episode of CommanderCast (Check out Strategy Segment on Card Expectation S7E9). Let’s look at the “as close as I could find original version” of my Doran deck from way back when. I am pretty sure this exact list isn’t the original but it is definitely the oldest that I still have access too in the GUDoug hall of records, and has all the earmarks of being a very early deck building attempt by an inexperienced EDH player. Plus the newest set represented in the list is Eventide so that shows it has some definite patina to it. There it is in all its glory. This list has a few cards I know I didn’t use for very long, like Helldozer and Cabal Conditioning. Being but a player new to the circumstances of EDH as a format, casual magic in general, and entering an established group those two cards specifically were heavily frowned upon so I obliged. The deck has many stalwarts of my early building in card choices and deck composition. 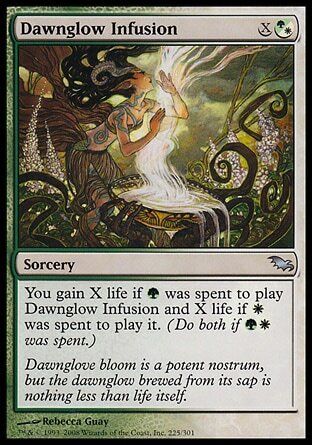 Dawnglow Infusion for huge life gains over and over, heavy card recursion, and too few land and creatures. I know at one point I only had 18 creatures in the deck. I doubt this list stayed like this for too long. I never really played the deck as general centric deck much, but I just liked that I had a three drop general that was a basically a 5/5 that wasn’t perceived as a threat until he was one hit away from general damaging someone. Being enamored by the the GWB color trio, Doran was a deck that I immediately tried to actively and aggressively acquire better and more expensive cards whenever I could. Cards started pouring into the deck and included such things as Pernicious Deed, Vindicate, Debtors’ Knell, more tutors, better mana base, Volrath’s Stronghold, Sylvan Library, Survival of the Fittest, Tooth and Nail, Beacon of Unrest, and more card draw to name a few, just looking at cards not in this version that predate Shards block that were in the last version. The deck progressed quickly as I was procuring more cards I didn’t have or adding fresh new cards from new released sets. Suddenly strategies and card evaluation started taking a more important role. When looking through an impressive amount of lists for this deck I was able to remanisce on all the various and different strategies the deck had. At one point the deck was a Rock, Reanimate, Astral Slide deck. Another glimpse at another list shows a token deck that wanted to abuse Life from the Loam, Worm Harvest, and the ever impressive combination of Mephidross Vampire and Malakir Bloodwitch draining my opponents over and over. I have had more strategies for this deck than I can count. Card evaluation further and further into the evolution of the deck suddenly became a lot more in depth, agonizing, and important. More important than even having a gimmicky strategy or desired play type other than just “best.” I remember a lot of seemingly odd realizations like Akroma, Angel of Wrath just isn’t good enough for what it costs, or Serra Ascendant really doesn’t do anything as it is just a dude. Cards suddenly needed to actively push the deck toward winning in visible foreseeable ways. No longer was “I like the card” or “this card looks fun” good enough for the deck. Everything needed to be a threat, find a threat, or advance you faster into a threat. Maybe it was the evolving level of my playgroup and a push towards better faster decks, maybe it was just a personal need to find the “best version” of the deck, or maybe it was just something that I started that I no longer had control over. Let’s just take a look at a seven mana creature slot I had in this deck as a case study. I know at some point in the infancy of my Doran Deck I had Plated Slagwurm which was great for the early primordial ooze days of a players EDH career. It is a big guy, it is undercosted, it has trample, and Hexproof. The problem is that it is just a dude, maybe even classifiable as derpy or even worse…Herp Derp. It doesn’t really interact with the game state. Sure it can block and attack, and could potentially win a game if it attacks a bunch of times over and over and over if it doesn’t die, but it really has little or no impact on the game. Like Plated Slagwurm another similar “do nothing” creature that I developed a long deep obsession with, especially when I started slinging EDH, was Clockwork Dragon. 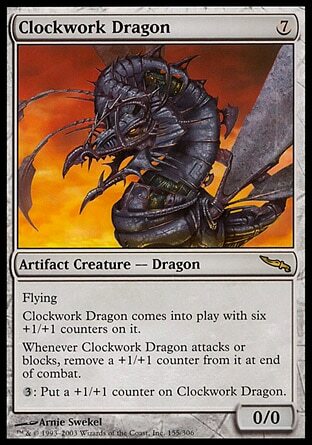 Clockwork Dragon to this day is still my favorite dragon, and seriously how could it not be as it can go in any deck (I have stacks on stacks on stacks of these laying around). The card was actually pretty great in “do nothing” or “durdle” decks that saunter through an EDH game trying to do things as inefficiently as possible, like a lot of my older decks used to do. Have a ton of mana open? Throw it into Clockwork Dragon. It didn’t’ take too long to turn it into the biggest flying threat on the board plus it was a decent mana sink, as this was back in the days of mana burn. Did I mention it is also Reveillark-able too? As deck your building gets better and you start wanting to play things and interact with the board on your turn, having a big 7 CMC mana sink that does nothing and doesn’t have an impact on the board isn’t going to be the best option anymore. 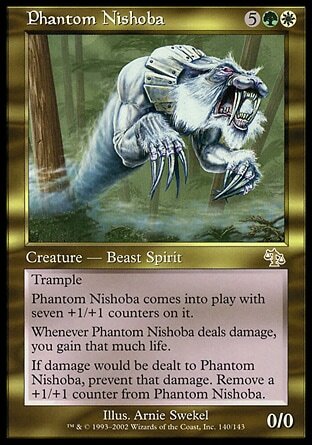 When I discovered Phantom Nishoba it essentially took the place of my favorite dragon. The card had a lot of upsides over both Plated Slagwurm and Clockwork Dragon. It just doesn’t die in combat and can block or attack several times, gaining some of that good good life in the process. It also is a Reveillark-able option as well. While this card was a better selection and effects the game more so than the others it still doesn’t represent a huge impactful presence on the board. Is it a good card? Yeah sure. Does it win games? probably not. Again it is just a dude, and a dude that most people really aren’t going to care about. It is very similar to Wurmcoil Engine with regards to the life gain and multiple “deaths it could take” before it goes to the yard. In case you want to know I don’t think Wurmcoil Engine is good enough either. It is a good card but not a great card unless you are dedicated to finding it and abusing it somehow. There was an never ending of string of similar 7 CMC creatures in and out of the deck that never seemed to want to stay. All “fun” cards but again not impact players. Card’s were tried, tested, and held up to scrutinizing criteria and each failed to impress and couldn’t cut the mustard. Again they were all fine cards but they were just cards that did something that amounted to nothing in most cases. Then came a block that ushered in a whole new breed of creatures that could strike fear and disgust into opponents, punch them in their snot lockers, and win games. Zendikar block heralded punishing creatures that had dramatic impact on the game as well as representing realistic win conditions. 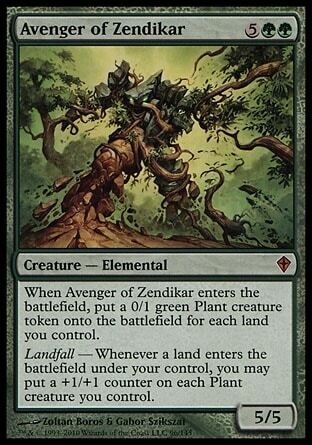 With respect to our 7 CMC example you have the emergence of the super staple green game changer Avenger of Zendikar. Now this is a win condition, this is a threat. This card can and does single-handedly win games. An army in a can that can only get bigger. Avenger loves haste, things that double counters and tokens, Warp Worlds, Genesis Waves, and Primal Surges. Avenger being a big threat aside, at 7 CMC I tried, and almost immediately cut, Pelakka Wurm and Novablast Wurm for being underwhelmingly just ok. Creatures with abilities that seem good but with respect to impact and winning they are pretty vanilla. Novablast Wurm was close to being impactful and can be in some cases, but it had enough drawbacks and had been involved in enough less than optimal situations that it couldn’t stay. Outside of our 7 CMC exploration Zendikar block also brought us our much hated colorless overlords the Eldrazi, so good everyone loathes them but still plays them. Scars block then brought another cycle of abominations to the game with the praetors. I remember when they came out Vorinclex, Voice of Hunger and Elesh Norn, Grand Cenobite I felt were the weakest friendliest variants. I don’t think that I was the only one to think this but what the hell was I thinking as they are easily the worst offenders in my opinion. Sheoldred, Whispering One and Elesh Norn are both notable for the purposes of this article because they fall in at 7 CMC, but Vorinclex is nothing to overlook at just one more mana above 7CMC . They represent incredible advantage and in many instances a crippling hindrance to your opponents. They give you enough advantage and your opponents enough disadvantage to be considered top of the line threats and finishers. Then as if praetors weren’t good enough Scars block added the best green and black x-spells money can buy in Genesis Wave and Exsanguinate, both of which have been bring about anticlimactic endings to fun games since they were released. By the next block, Innistrad, my interest with my Doran deck had waned significantly. I think the only thing that I even added from Innistrad was Vault of the Archangel (which was pretty amazing, easy to put into play or find, and provided a little nudge that pulled you way a head in games). While my changes based on impactful, threat or threat enabling, game winning card evaluation had transformed Doran into a really good deck, it had also transmogrified into something that I didn’t enjoy playing anymore. The deck was full of staples which was all well and fine, but it was lacking a personal touch, something that made it mine or signified it was mine. There was no longer a strategy other than barfing something nasty into play fast or snuffing everyone’s candle with a big x-spell. So here it is, my Doran deck. The final list of good stuff (to be read like an epitaph). EDH is a format driven by fun and enjoyment. Unlike tournament sanctioned formats that tend to lean towards standard sets of known homogeneous lists with little variance, EDH is more personalized and allows for almost anything and everything. When a EDH decklists devolve into purely strained, sanitized, and agreed upon sets of “strictly better” or “best” type cards it starts to lose what made it appealing in the first place. That being the idea that the format is wide open, that anything can and will happen or be played, and that you are only limited by your own ingenuity and drive to succeed, experiment, and build. While that can and should include decks like my Doran deck if that is what you like, I just find that a little too formless and tend to lean towards exploring new territory (though I do enjoy a good competitive tryhard game now and then). Will I ever rebuild my Doran deck? I am not sure that it is in the cards (PUN!!) to do so. Knowing how I had the deck built during its last runs, I don’t think that there is anyway that I could retroactively unsee what I have seen or look at the deck without the filter that I subjected it too for all these years. I had tried to build a version actually using Doran’s ability but it just seemed like a joke and too much of a gimmick for even me. When you build a deck it is up to you to judge how far down the rabbit hole you want to go with regards to your card evaluation. If you just strictly want the best cards, your deck suddenly starts lacking thematic strategy, overlapping application of cards, and purpose. While maybe not the case for others, for me it loses its individuality and what made you enjoy the deck in the first place. Nothing lasts forever, especially when it comes to EDH decks.